The spirit catches you and you fall down is the closest translation of the word seizure into the Hmong language. How can a physician impress the need to treat a condition upon individuals who don’t believe the body contains organs? How can these individuals impress it upon the physician that they believe their daughter would be better off using healing ceremonies versus watching her suffer the side effects caused by the medication being prescribed? 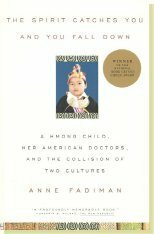 The reason this book impacted me the way it did is Fadiman’s way of illustrating, not just the occasional difficulty of translating certain words, but that certain concepts are difficult to translate across cultural divides. This is the reason why we use highly skilled translators in our translation division, and why we concern ourselves with cultural equivalence in our language testing. We need to make sure that what we produce not only meets our client’s expectations in terms of the words in black and white, but also that it reflects the layers of meaning across cultures.